Tom Anselmi's voice sounded a bit ragged across the miles, a victim of the perpetual sandstorms in Kandahar, Afghanistan. 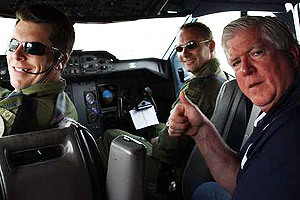 mapleleafs.com GM Brian Burke rides with Canadian soldiers during the Leafs' recent trip to Afghanistan. It was a reminder of the distance, not just in miles, that separates the world we inhabit here in North America, and the daily lives of the soldiers from Canada, the United States and beyond whose duties have taken them to this long-troubled country. The executive vice president and COO of Maple Leaf Sports and Entertainment is in the midst of his fourth trip to Afghanistan in what has become the ultimate hockey road trip. For this year's journey, Anselmi and alumni associations from the Leafs and the NHL brought along 15 former NHLers, 12 rock-and-rollers, a NASCAR driver, a bull rider and, oh yeah, something called the Stanley Cup. Veteran Keeper of the Cup Mike Bolt told ESPN.com last week in a text message the soldiers at the Kandahar base were loving every minute with the prized hockey trophy. During the visit, the Cup sat on a table near the ball hockey rink (complete with what looked to be NHL-regulation boards) where there has been some hotly contested games. Anselmi told ESPN.com the cheering section for a game involving Slovak soldiers would have put many NHL fan clubs to shame. Added Leafs GM Brian Burke, who made last week's trip and coached the NHLers in one of the ball hockey games, "It is awesome to be here." "[We're] honored and proud to salute these men and women to whom we owe so much," Burke wrote in an e-mail to ESPN.com. "The real heroes in the United States and Canada don't wear hockey uniforms. They wear camo, and police and firefighters' uniforms. I am thrilled to be here."